Halloween is right around the corner…are you ready? Decorating for this Spooktacular holiday doesn’t mean you have to scare everyone away. Start with a couple of friendly fairy tale Halloween flags in the front yard, include a pair of boy and girl sitting scarecrows to keep the birds at bay and provide a fanciful touch, add a seasonal welcome mat to the front porch, and finish by hanging a pretty fall wreath on your front door. Your neighbors and friends will enjoy your Halloween decorations and won’t be afraid to ring your doorbell when they come to visit. Are you skipping the door to door trick or treating and planning a special party to celebrate Halloween this year? 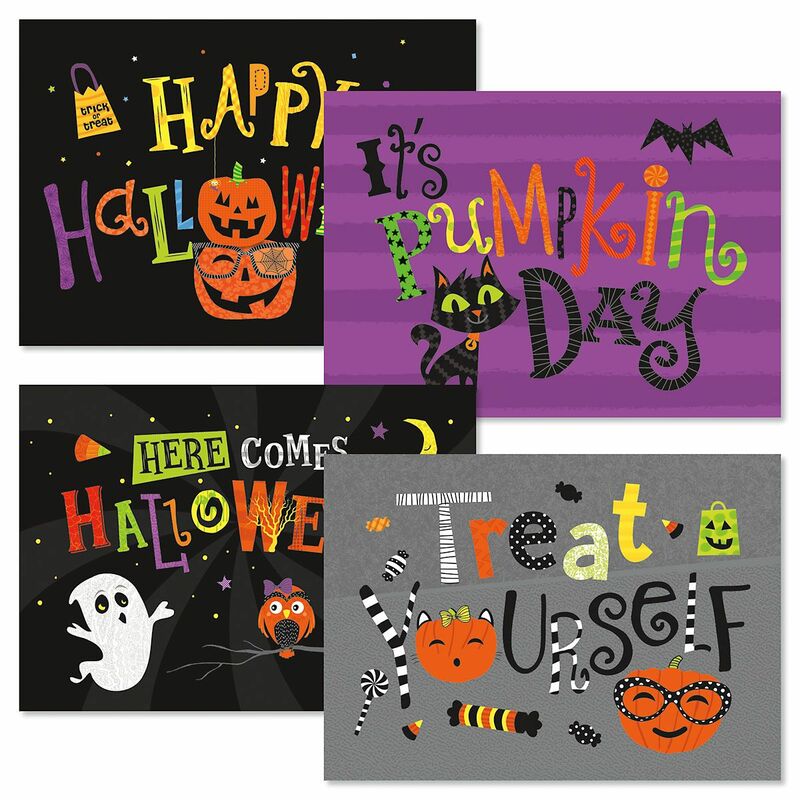 Choose from an array of Boo-tiful cards to announce the festivities and build excitement and anticipation for your Happy Halloween party. Get the little ones involved by letting them build their own Halloween scenes with stickers. Give your front door a festive feel with some DIY spooky spiders or flying bats. For an added touch of fun, add some haunt to your home with these decorating tricks and treats from our friends at Sunset Magazine. For instructions on how to create some hauntingly beautiful table settings, check out one of our favorite ideas from Gardinista. Using fall leaves dipped in wax, white bone china, and a few colorful gourds you can create a tablescape that celebrates the holiday yet remains elegant and tasteful. Halloween is a great time to break out your crafting skills for homemade decorations that are fun to make. Are the kids having a party of their own? Why not “mummify” a galvanized tub to create a special look that adds to the theme while it keeps the party drinks cold? A little cheesecloth, some spooky cut out eyes and voila! We hear that black is the new orange and serving up an all-black menu at your Halloween party is a fun way to incorporate this color into your decorations and serve up a deliciously dark Halloween spread this year. From an appetizer of black bean hummus with blue corn chips for dipping, to black rice salad with butternut squash and pomegranate seeds, squid ink paella as a main course, and finishing it all off with black sesame ice cream, black sesame cupcakes or lemon-black sesame baked doughnuts for dessert, your deep, dark, delicious menu will surprise and delight your dinner guests as you celebrate the spookiest of holidays.